With the changing of the leaves and cooler temps October ushers in pumpkin flavored EVERYTHING. Desserts, cereals, spreads oh my! Why all the hype? 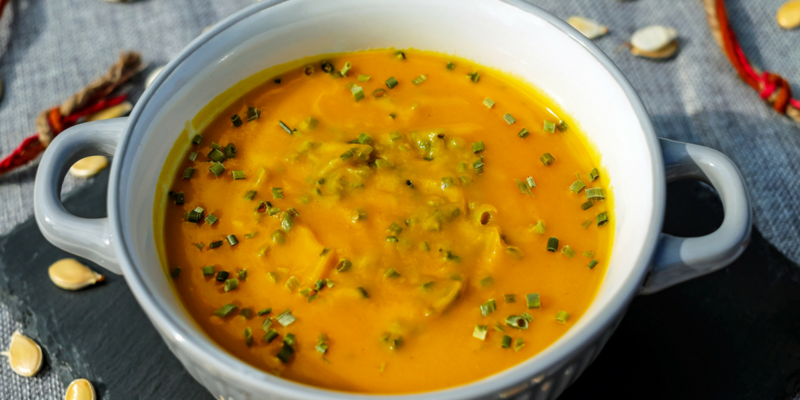 Pumpkin is low in calories about 80 for 1 cup puree. It’s a good source of fiber, Vitamins A and C and minerals like iron, potassium and manganese. Even the seeds are nutritious being a source of protein, magnesium and zinc. There are many ways to enjoy pumpkins. It can be blended into oatmeal, applesauce, pancake batter, smoothies or made into a soup or bread. Or it can simply be cubed and roasted or mashed as a seasonal side dish. Roasted pumpkin seeds can be a garnish to salads, cereals or soups. Pumpkins can also be used as decorations either carved, used as a planter for your fall mums or a simple table center piece. Check out our October nutrition corner board featuring pumpkins or join us in the kitchen during our culinary classes for more tips and recipes that incorporate pumpkins.